Disk Aid is a professional grade system utility app for keeping your Mac running at its very best. It is lovingly developed by the leaders in utility software, FIPLAB, who have created award-winning and extremely popular apps used by millions of Mac users around the world. Our latest app, Disk Aid, has been built from the ground up for the very best performance and disk space saving ability. 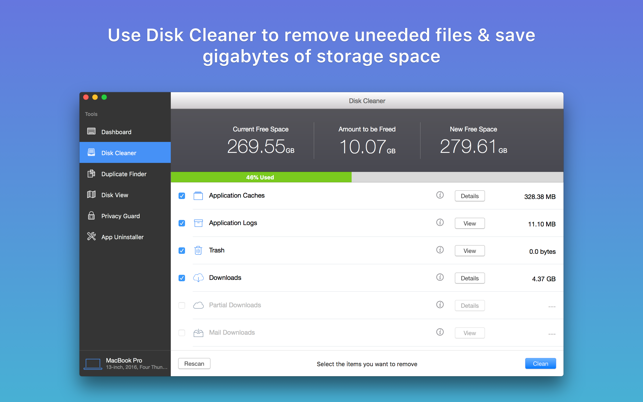 Disk Aid will deeply clean, optimize and protect your Mac, all whilst saving you up to several gigabytes of precious disk space! 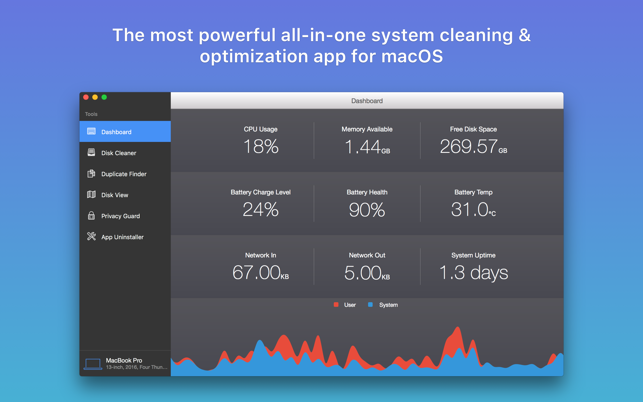 • Provides a quick and informative overview of your most important Mac system stats. • Perfect for at a glance statistics and performance monitoring. • Real-time insight into CPU, Memory, Battery Usage and more. • This conducts a deep and thorough search to identify all kinds of potential unneeded and junk files that can be removed from your Mac's main hard drive. • These include Application Caches, Logs, Mail Downloads, Browser Data, Partial Downloads, Old iOS Updates, Developer Files etc. 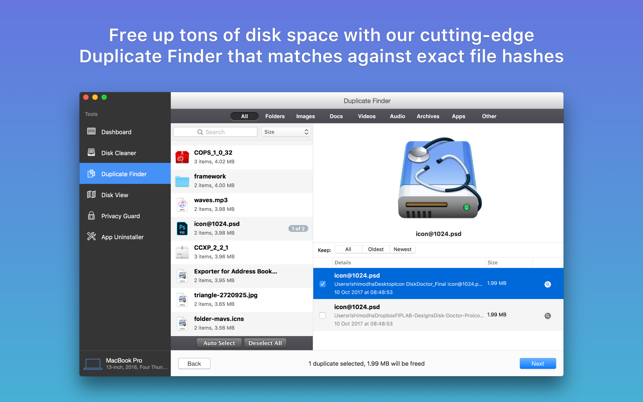 • Also contains a handy large file scanner that will highlight the largest files stored on your Mac, and is perfect to get rid of those pesky old videos and downloads you no longer need! • This module by itself can save users several useful gigabytes of space. • This benefits from our industry leading duplicate detection algorithm. It quickly scans your storage drives to identify exact duplicates, i.e. files and folders that are total duplicates based on their SHA-1 hash values. • Compare duplicates between multiple folders/locations and selectively choose which duplicates to delete. • Use our intelligent auto-selection process to save time picking which duplicates to delete and which originals to keep. • Fully supports external and network drives and also iPhoto and Photo app libraries. • Blacklist certain folders to ensure they are never scanned. • Filter and sort duplicates depending on their type/size/name/age, etc. • This module provides a visual tree map of the storage drive you scan. • Tree maps can be viewed in various beautiful themes. 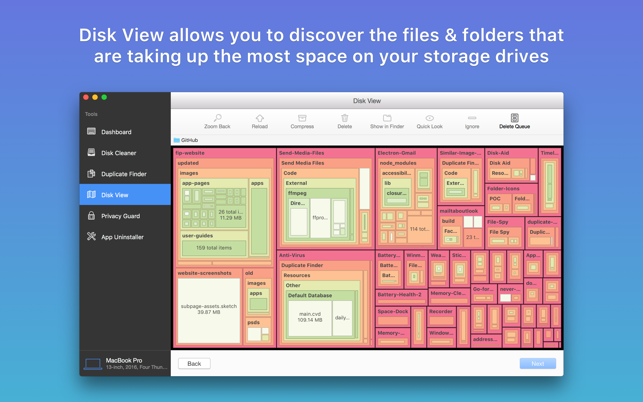 • Not just visually pleasing but also very useful as it allows you to quickly identify large files and folders that are taking up the most space on your storage drive. • Drill-down into folders to see more details. • Use this information to to either delete or compress files/folders in order to free up valuable disk space. • The best way to find and remove potential threats to your Mac's privacy and security. • Remove malicious browser extensions and spyware that cause annoying popup ads. • Scans your browsers, flash plugins and much more in order to remove Caches, Cookies, History, Downloads, Forms, Recent Searches, Web Storage, Last Session Information and much more. • The perfect module for not only removing unneeded applications, but also all related files that an application has created in order for it to function. • Related files include caches, preferences, plist and container/library folders, which are no longer required if you want to delete an application. Please Note: App Uninstaller cannot remove all apps completely due to sandbox restrictions. If this is the case, it will direct you to the specific file locations and allow you to manually remove any apps/files that it could not automatically delete on your behalf. We've worked hard to make Disk Aid as powerful and efficient as possible for you to use. We would love to hear your thoughts via email and make any improvements to future versions of this app. We intend to have an active development cycle powered by your feedback and support!